Fun Fact: By the late 1920s there were over 150 rooftop courses in New York City alone, and tens of thousands across the United States. At the time, it was called midget golf. The ‘greens’ were either made of a compound of cottonseed hulls dyed green or felt (as shown in the photo). 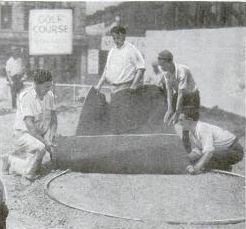 Check out this article from the November 1930 Popular Science for more miniature golf history.